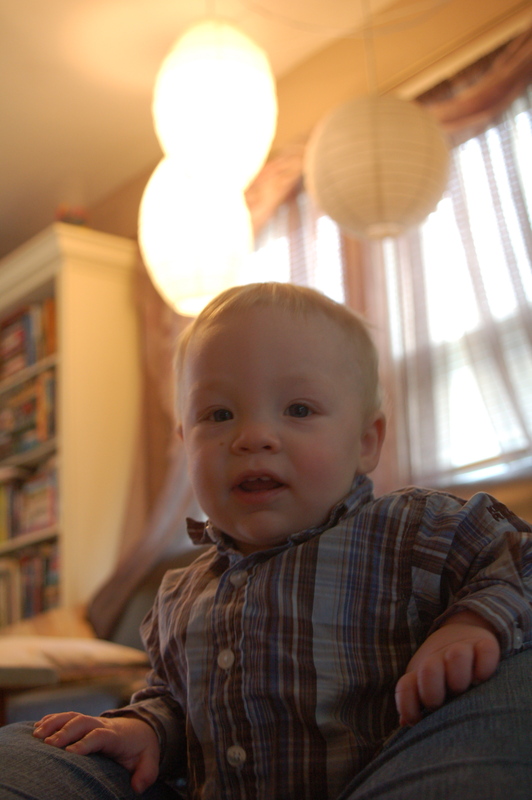 He claps, he waves, he climbs stairs unaided. He’s very interested in being walked around (hanging on to your fingers). He dances (happy tummy dance, to music, to the music in his head). He initiates games (peek-a-boo, row your boat, a bouncing game). He’s started trying to play tug with Maisie (she’s still a bit strong for him). He signed his first word yesterday: More. He says Mama and Dada, and a couple other words we haven’t figured out the meaning of yet. His babbling is starting to sound more and more like real words and even short sentences. 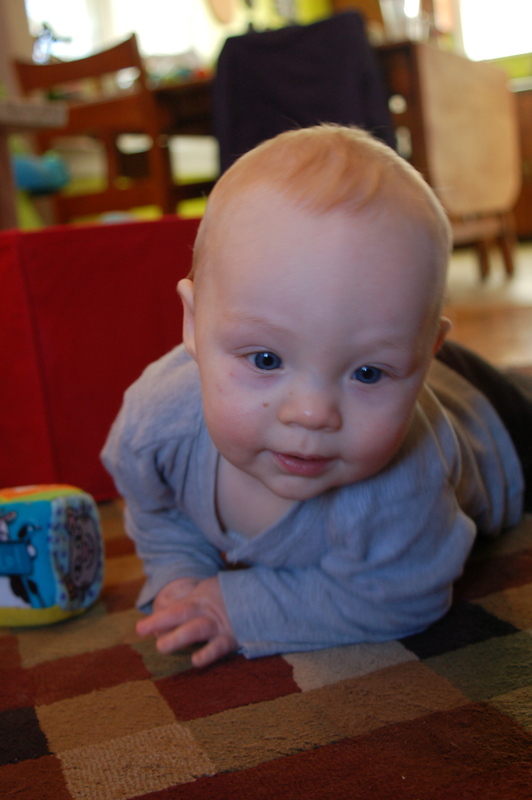 He’s starting to communicate — to be understood, even, and that’s thrilling to me. He has eight teeth and is very close to having two more. He has a lot of hair. It’s not long, but it has definite volume. He’s starting to transition (or maybe already has and I’m just still in denial) to only one nap each day. He often needs more, but sleep is hard for him. He’s very adventurous, but he likes to know Mama is near, especially in new social situations. He only just started to cry when I leave him. Note: I wrote the following two paragraphs when he was just over 8 months, intending to add to it, polish it, and post it at 9 months. Oops. He’s always pushing the boundaries. I’m not talking about obedience. Before he could really stand, he was trying to pivot. Before he could solidly support himself, he was attempting to crouch down and pick something up off the floor, while standing. Before he could stand unsupported, he was placing one of his hands on a door knob and opening, closing, opening, while still trying to balance, with only support from the other hand. And while it’s exasperating and sometimes scary to watch, at least for this parent, it’s also inspiring and thrilling. He’s constantly growing and pushing himself. Reaching new heights (literally and figuratively). Learning new skills and tackling challenging feats. 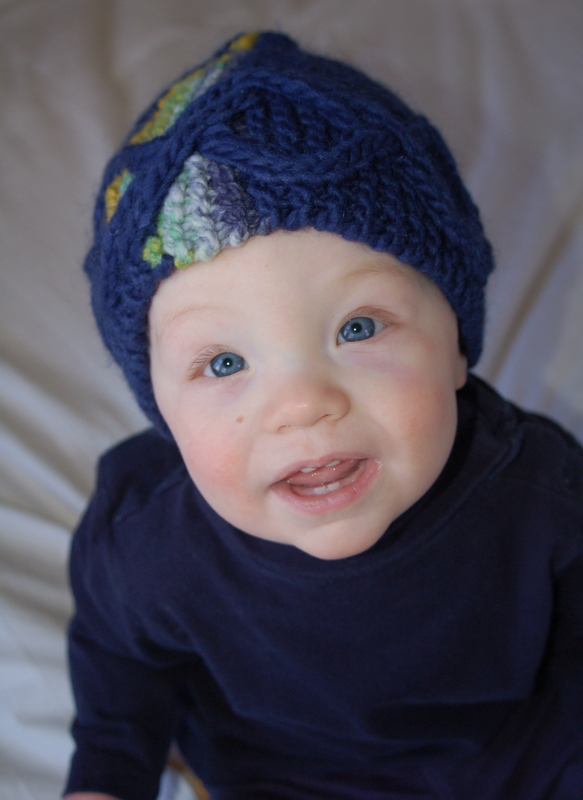 One of my groups on Ravelry is having a hat swap for our babies, and my swap partner received the hat I made, so I can finally unveil this secret! I made Leethal’s Wobble Bass hat. Seen here modeled on my little guy. 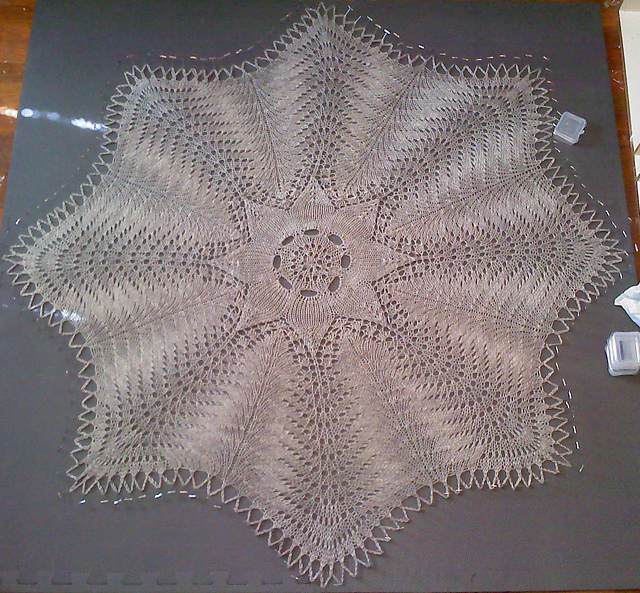 My project page on Ravelry. This was a tough project for me, but I’m pretty thrilled with how it turned out, although it’s not without its flaws. 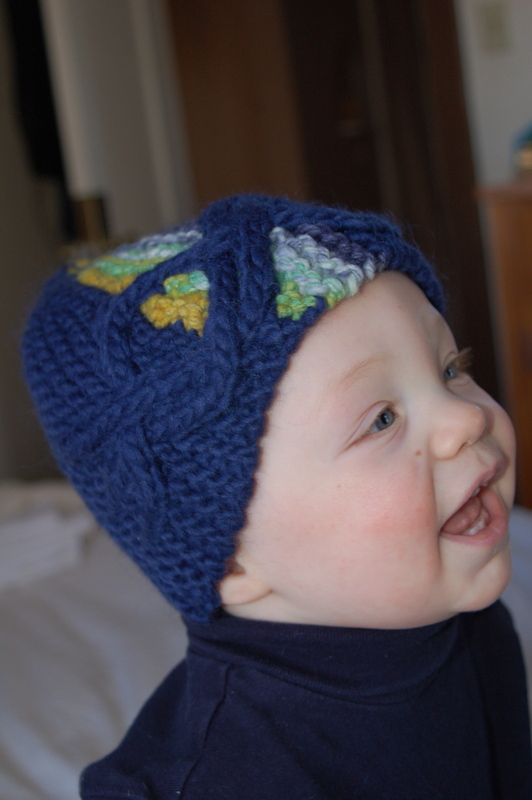 I might have been pushing the envelope a bit, using super bulky yarn to make a baby/toddler-sized hat, but it still worked. 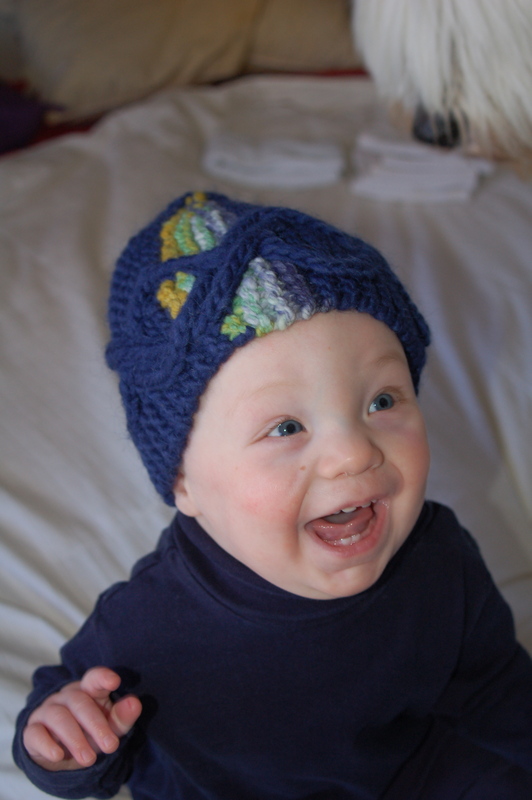 The pattern is awesome, a very engaging (heh) knit and the finished object is pretty fun, if you ask me. 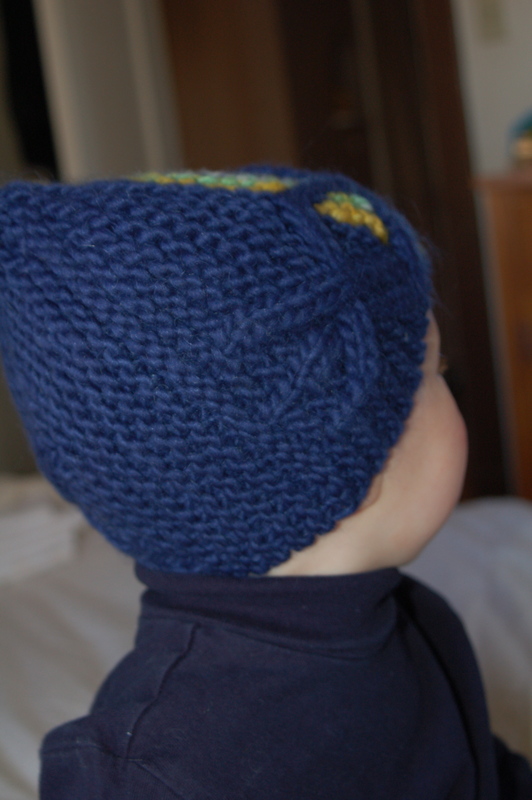 You can see my kitchener in garter stitch here, it didn’t completely disappear. My tension must have been off. Here are a couple more photos, just for grins. I’ve wanted to try my hand at Leethal’s patterns for quite a while, and this won’t be my only foray. But I might have to make this hat again first, so I don’t have to rely on (digital) photographs as proof of this summit conquered. The recipient, elpalchica, posted about the hat today, too. I’m so glad she likes it! Have you participated in swaps before? Wanna see more? Check out FO Friday and Fiber Arts Friday. While I didn’t love everything about the pattern, or the knitting, I do think I quite like the finished sweater. This was my first bottom-up sweater, my first non-raglan sweater. I made the 12-month size and added an inch to the length of the body of the sweater and about 3/4-inch to the sleeve length, because my boy is tall and long-torso-ed. It doesn’t look as big on him (at 7 months) as I thought it was, as I was aiming for, but it will still hopefully fit him all this winter. 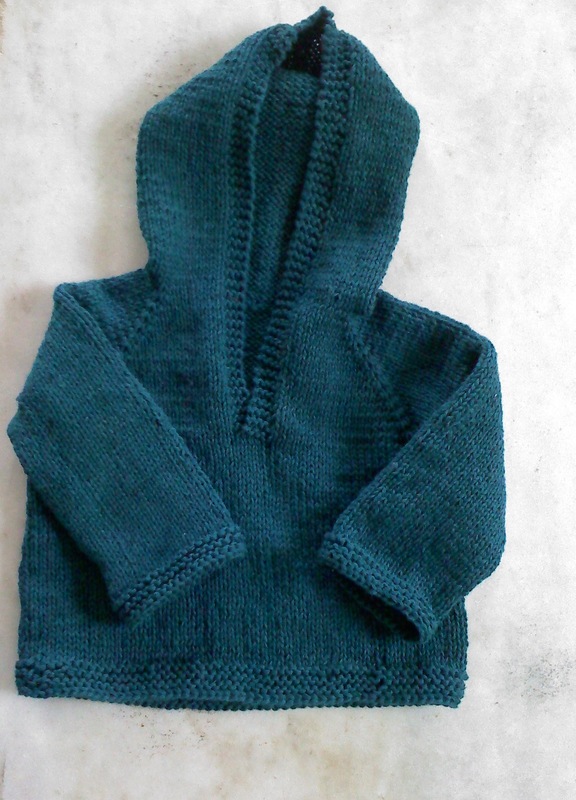 I used recycled sweater yarn, in 100 percent cotton; tripling the yarn gave me gauge on the recommended needle size. The little-one-who’s-not-so-little turned 7 months old yesterday. A whole month more than half a year. It’s mind boggling. 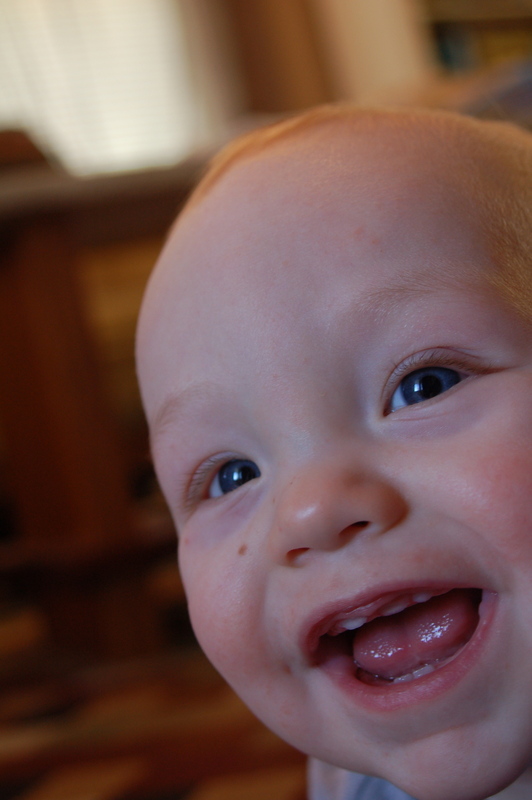 Right now, he is still super smiley and he laughs a lot. He has five teeth; I think a sixth is probably close. He army crawls and is pretty proficient at it, although he hasn’t yet seemed to grasp that he could move himself to Mama (or whoever) when he suddenly decides he wants to be held, instead of lying there crying. He has learned that Mama can walk away and leave him. 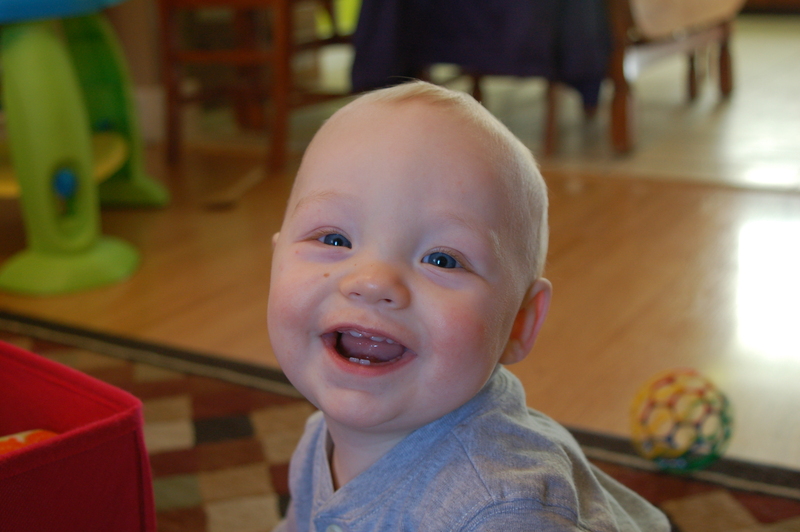 Even if he’s playing contentedly, either by himself or with Daddy, when I walk by, he cries. He *loves* to watch and chase and pull her hair pet the dog. He enjoys being read to, when he can sit still long enough (which isn’t all that rare, actually). He doesn’t really have a favorite toy. He doesn’t like long car rides. He likes eating food (pretty much everything he’s tried he’s gobbled down), but he clearly doesn’t think of it as sustenance yet. He takes two naps a day, which hopefully total three hours or more. He goes to bed at 6:30 or 7 and wakes up at 6:30 or 7, sometimes (but not always) waking once or twice in the night. Sometimes when it’s time for sleep, he rejects any soothing efforts and reaches for his crib, crying until we put him down. It’s got a I’ll do it myself! feel to it. He loves to bounce and jump, whether with his hands being held by someone, in the exersaucer, or in the Johnny Jump Up. Moving vertically is very fun. He likes motorboat sounds and tickles. Buttons are fun, as is being outside. And windows. Mostly everything goes in the mouth. He likes playing peek-a-boo, and is sometimes the initiator. I’ve always loved making baby blankets, so I couldn’t refrain from crafting an abundance of them for my little one. This one, being wool *and* lace, isn’t the most practical. And now, it’s so hot, that I haven’t gotten it off the shelf yet. Hopefully this fall. Still, it went quickly and I enjoyed knitting it. This one I made with cotton yarn, reclaimed from old thrift store sweaters. The photowas taken quite awhile ago, he’s quite a bit bigger than this now. Also, have I mentioned HOT? This one has a story behind it. I started this blanket when I was about 6-8 years old. It was my first project after Mom taught me how to crochet. I worked on it a lot, and my gauge (and craft overall) improved dramatically over the course of the work. When I found it, still unfinished, in my adulthood, I thought it might be fun to finish it up for my future child/children. 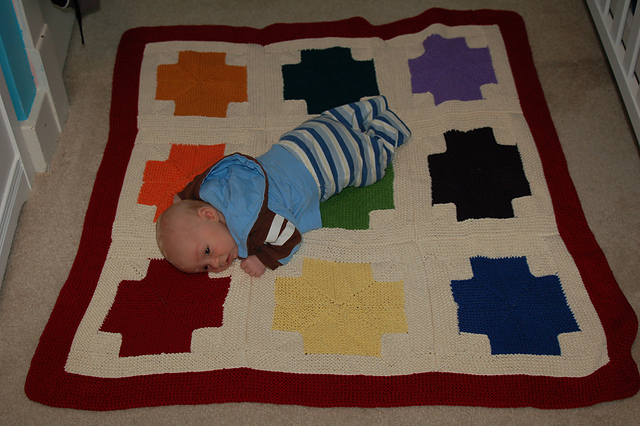 I worked on it intermittently for years and finally got it finished just before this little guy was born. I left in the parts made when I was obviously very much a beginner. There’s one more blanket to show, but it’s still not done! I started piecing it together earlier this month, so it should be done by this fall, at least. Want to see the earlier installments? Asa is getting some good use out of a wool soaker that was first worn by his great-grandfather. Grandma had two of them in storage, and since she knew we were going to cloth diaper and also because I love wool, she got them out while we awaited the little guy’s arrival. First we washed and aired them out. Grandma mended the holes. The drawstrings had disintegrated, so we picked yarn and I knit new I-cords. In both cases (I only have a photo of one of them for you today, but there are two soakers) the seam is machine sewn. 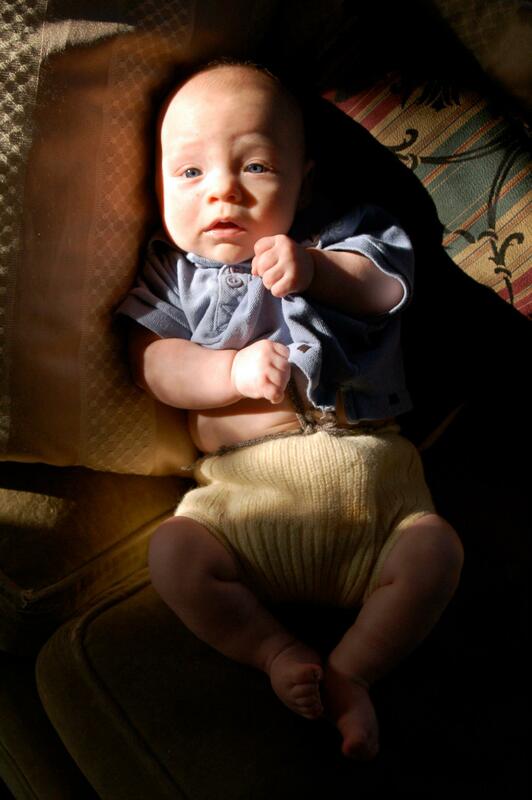 Dusk light and pillows, in his great-grandfather’s wool soaker. You can click the photo to view it larger. I love pieces — and crafts — that span generations! 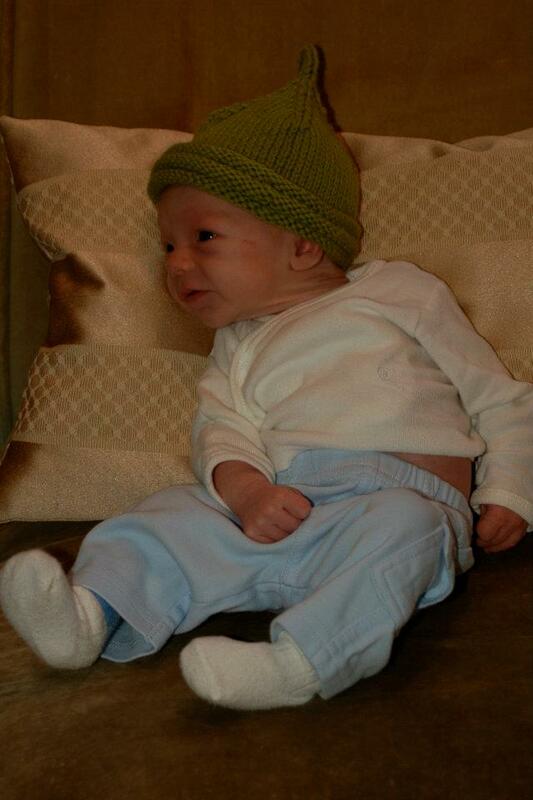 I knit two sweaters for Sprout while he was in utero. They’re both still too big for him, so no modeled shots today. Hopefully they’ll fit him well once we get back to cooler weather this fall/winter. 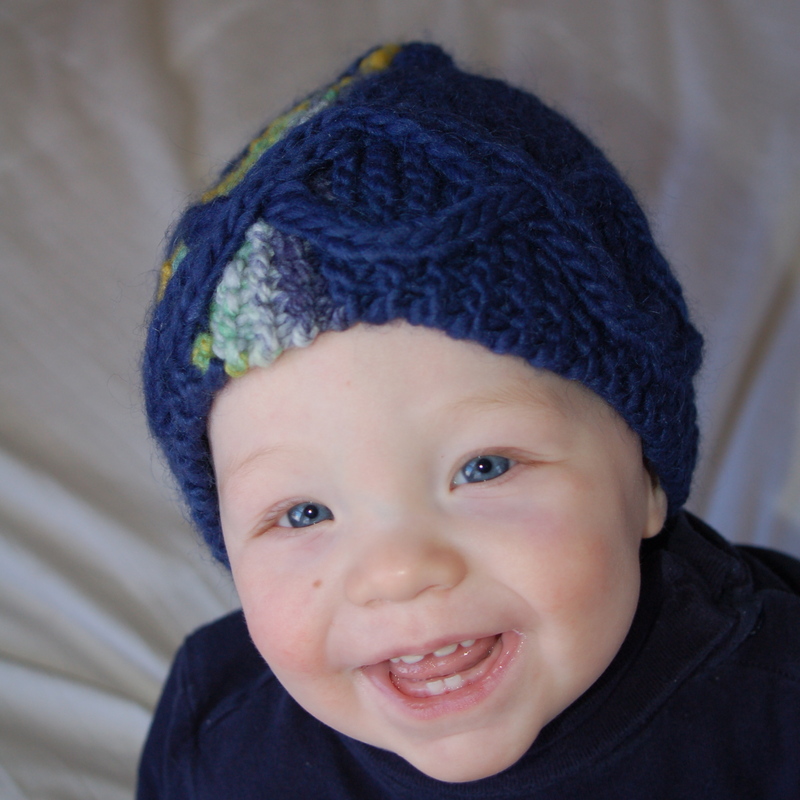 I spun the main yarn used for this Baby Beau several years ago, with no particular use in mind. The blue is Lion Brand wool and the green for the button bands is Cascade 220. This sweater is made from cotton yarn reclaimed from an old store-bought sweater. I knew I wanted to make a cotton sweater. When stash-diving, I found this yarn and decided I wanted to use it for that piece. And then the pattern hunt began. I first tried a sweater vest, but I couldn’t get the gauge to work (it had an animal on the front, using intarsia, so I couldn’t just fudge the gauge). After abandoning that vest idea, I had some trouble. But eventually I found this pattern that included the hood option. I modified it (as many others before me) to be a pullover rather than another cardigan. 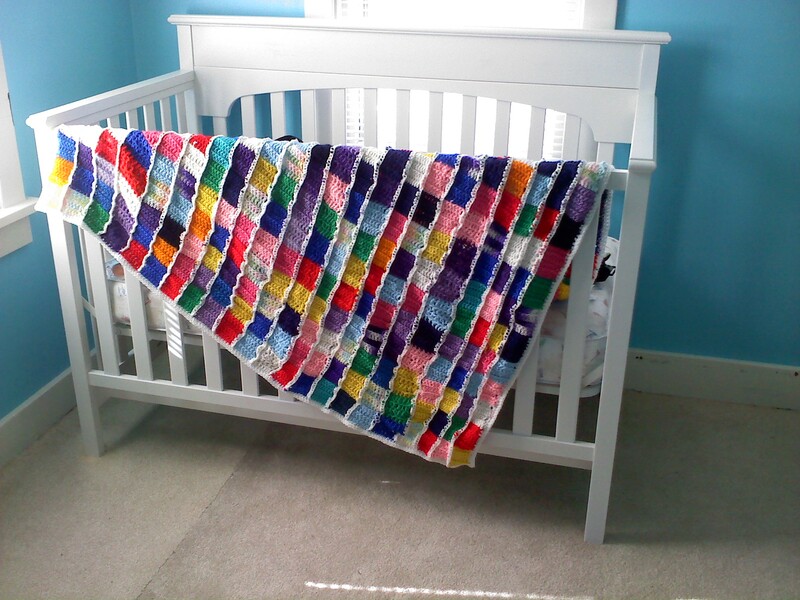 Just one more post of baby knits left: blankets! And speaking of baby, he just woke up. Asa Anders Nielsen was born at 6 p.m. April 28, 2012. 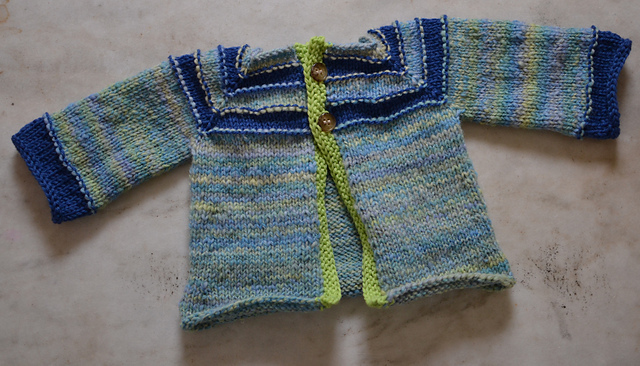 A much-delayed post of baby knits. Let’s start with the one fibery failure, shall we? 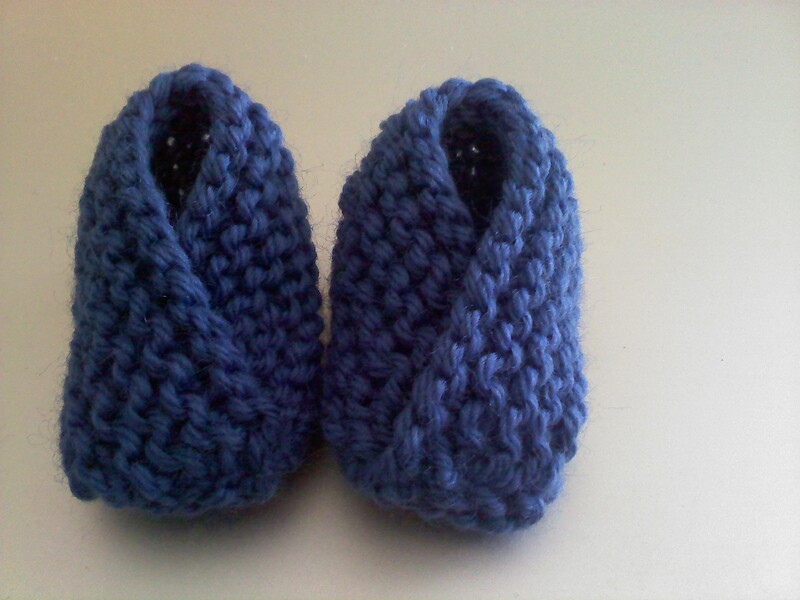 These booties, while super cute, simple and quick to knit, were too small for wee Asa when he was born. They’ve a place in the nursery decor for the moment. 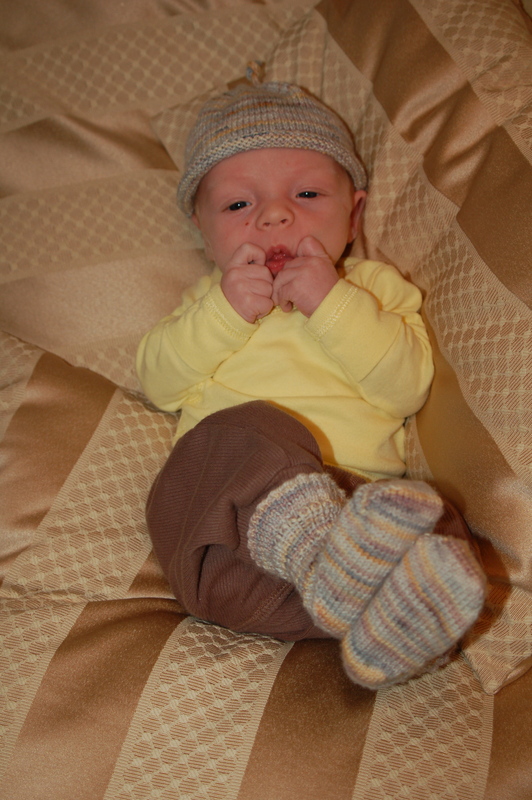 These booties/socks did work, though, and they also have a matching hat. Then there’s the hat you’ve already seen. 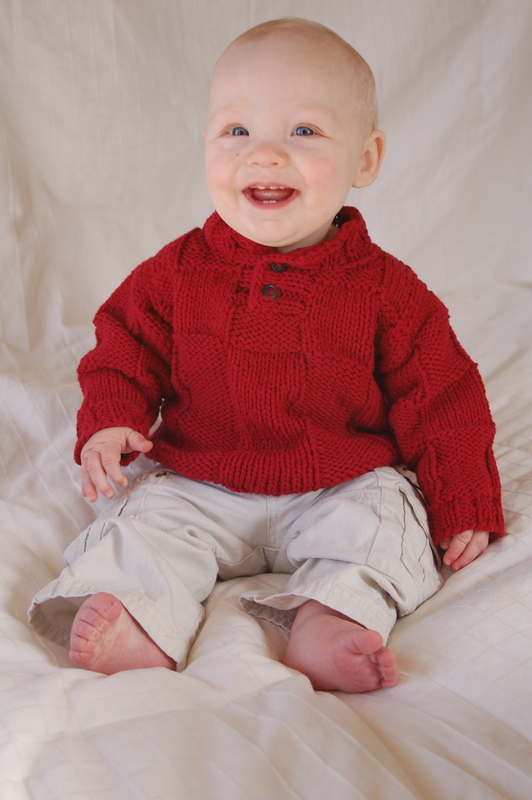 I’ll have two more posts of baby knits for you when I can get them drafted.